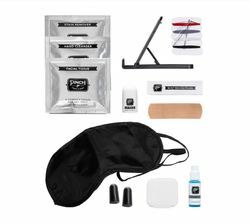 Bring your own business class with our Mini Travel Kit. Designed for minimum space and maximum in-flight comfort, this kit contains 12 must-haves. Available in all 7 colors. The packaging comes with a depiction of what's inside in each kit. 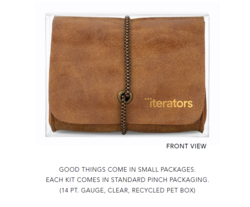 This is the perfect gift for: conferences, meetings, room drops, welcome bags, celebrations, training events, client lounges and trade shows. All bags are vegan leather with elastic closure, unless noted otherwise. Measures 3.75"x 3"x 1.5", and comes in standard Pinch packaging. 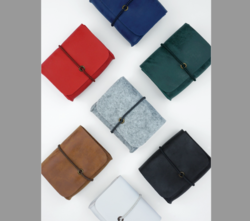 Bag Colors: Grey felt, cognac, white, black, navy blue, hunter green, red.